By Jeff Aranow: Saul Canelo Alvarez took advantage of Rocky Fielding’s careless mistake of trading shots with him at close range to hurt him with body shots and stop him in the 3rd round to take his WBA ‘regular’ super middleweight title on DAZN in front of a sold out crowd of 20,112 fans at Madison Square Garden in New York. It was a questionable move on the 6’1″ Fielding’s part to give up his five inch height and reach advantage to fight the shorter 5’8″ Canelo at close proximity last night, which made it easy for the Mexican star to hurt him with body shots. Fielding hit the deck 4 times in the fight before the slaughter was mercifully stopped by referee Ricky Gonzalez at 2:38 of round 3. The logical question boxing fans were asking afterwards is why didn’t Fielding adapt his game after the first body shot knockdown in round one by moving to the outside to keep Canelo from getting close? In training for the fight, Fielding had loads of time to study Canelo’s two fights against Gennady Golovkin to note what works against him, and what doesn’t work. Fielding made the same mistakes GGG did in his second fight with Canelo by allowing the Mexican star to get too close. This fight wasn’t supposed to be this easy for the 28-year-old Canelo. While the boxing fans did expect Alvarez to triumph over the little known 31-year-old Fielding, they didn’t think the fight was going to be a massacre like it ended up being. The shots that Canelo hurt Fielding with would have given any fighter in the super middleweight division problems last Saturday night. Fielding made a colossal blunder that he never corrected by allowing Canelo to get close to him to throw his body shots. Normally a smart fighter that holds a world title will adapt when they discover that they’re having problems against a shorter opponent, but we didn’t see that with Fielding. He actually made things worse for himself by backing up against the ropes and covering up in each round like a glorified sparring partner. If you do that against a fighter like Canelo, he’s going to eat you up and attack the body with aimed punches to eventually get you out of there. Canelo’s fight last night at super middleweight might be his last in the division. He still hasn’t decided whether he’ll continue to fight in the 168 lb weight class or not, although his promoter Oscar De La Hoya seems to like the idea. He’d like to keep Canelo’s options open by being able to fight at 160 and 168 to get the best possible fights instead of being limited to just the middleweight division. The problem with Canelo taking that course is that he would be expected to fight better fighters at super middleweight than what the boxing world saw last Saturday night against Fielding. The fans would want Canelo to fight the top super middleweights like Callum Smith, David Benavidez, Jose Uzcategui, George Groves and Chris Eubank Jr. It won’t help Canelo’s popularity if Golden Boy continues to hand-pick easy marks like Fielding for their Mexican star to bowl over in fights with a predictable outcome. Before last Saturday night, what fans don’t know is Fielding had already been knocked out in the 1st round by the super middleweight division’s best fighter in Callum Smith in 2015. Smith did a much cleaner job of getting Fielding out of there than Canelo did. “It was a great experience for fighting here. I hope this is the first of many fights. It’s an honor fighting here,” Canelo said about his fight at Madison Square Garden in New York. You can’t fault Golden Boy Promotions in putting Canelo in with the weakest of the super middleweight champions in Rocky Fielding last night. It’s never easy for a fighter to move up a weight class, and they’re generally given a free pass by taking on a soft fighter in their first fight in a new division. Canelo got that soft fighter in Fielding, who never have won a world title at super middleweight if he had to go through Callum Smith to get the belt. But now that the mismatch against a weak 168 lb champion is over, it’s time for Canelo to step up against a good super middleweight if he chooses to stay in the weight class. Most boxing fans doubt he will. 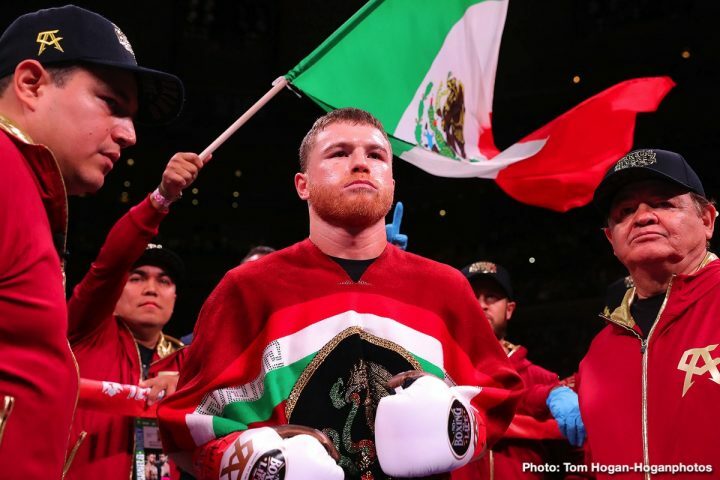 They see Canelo returning to the safety of the 160 lb division to defend his WBA/WBC middleweight titles against either Daniel Jacobs or Gennady Golovkin on May 4. Jacobs was given free access to the ring last night after the Canelo-Fielding fight, which suggests that he’ll be the one that faces Alvarez on May 4. Golden Boy likely wouldn’t have allowed Jacobs into the ring if he wasn’t going to be Canelo’s next opponent in May. You can argue that the only reason that there wasn’t a face off between Canelo and Jacobs is that the fight still needs to be negotiated. It would be a mistake on Golden Boy’s part to make an announcement about the Canelo vs. Jacobs fight right now without it being negotiated. The last thing that Golden Boy wants is for Jacobs to ask for more money after learning that he’s going to be Canelo’s next opponent. Golden Boy Promotions will likely be bringing Canelo back to New York in the future for fights, but not in his next contest on May 4. They’ve already booked his favorite venue, the T-Mobile Arena in Las Vegas, Nevada. That’s a venue that will work for well for him against the likes of Daniel Jacobs. “Tonight was a great night for Canelo. He showed that he can hang with the big boys at 168. He looked very comfortable. I have to congratulate Canelo,” De La Hoya said afterwards. In truth, Canelo didn’t prove that he could “hang with the big boys at 168,” as De La Hoya says. Fielding isn’t a big puncher in the super middleweight division. Fielding’s 52% KO percentage is evidence of his lack of power. To be considered a big puncher in a weight class, a fighter needs to have a KO percentage of at least 80%, and Fielding is far from that with his 52% knockout percentage. For Canelo to hang with the true “big boys” at super middleweight, he’s going to need to face Callum Smith, David Benavidez, George Groves and Jose Uzcategui. Those are the top guys at super middleweight at the moment. WBO 168 lb champion Gilberto ‘Zurdo’ Ramirez is moving up in weight to 175, so he’s not among the list. If he were staying at 168, you’d have to include him as a guy that Canelo would need to deal with for him to be hanging with the top fighters. A day after last night’s fight, boxing fans on social media are ripping Canelo, saying that he took the easy fight at super middleweight against a fighter with limited talent in Fielding for an easy money showcase fight. The fans weren’t entirely impressed with the fight, calling it a ‘joke fight’ due to how poor Fielding looked from start to finish. The fact that it wasn’t a competitive fight makes the boxing public view Canelo’s win over Fielding as a disappointing one. It’s nice obviously for fighters to blow out there opponents from time to time, but it’s not a good thing when a fighter looks as bad as Fielding did. He looked like a domestic level guy that didn’t belong inside the ring with Canelo. The win for Canelo was his first of his 11-fight, 5-year, $365 million contract with DAZN. It was always expected that Canelo would take a gimme in his first fight of his contract with DAZN. With this mismatch over, Canelo needs to start fighting quality fighters once again, be it at 160 or 168.